‘Alpine’ landscape on the Moon This image, taken by the Advanced Moon Micro-Imager Experiment (AMIE) on board ESA’s SMART-1 spacecraft, shows the lunar Alps (Montes Alpes) on the Moon. SMART-1 views Glushko crater on the Moon This image, taken by the Advanced Moon Micro-Imager Experiment (AMIE) on board ESA’s SMART-1 spacecraft, shows Glushko impact crater on the Moon. SMART-1 views Hadley Rille near Apollo 15 landing site This image, taken by the Advanced Moon Micro-Imager Experiment (AMIE) on board ESA’s SMART-1 spacecraft, shows the Hadley Rille on the south-east edge of Mare Imbrium on the Moon. SMART-1's first images from the Moon ESA's SMART-1 captured its first close-range images of the Moon this January, during a sequence of test lunar observations from an altitude between 1000 and 5000 kilometres above the lunar surface. 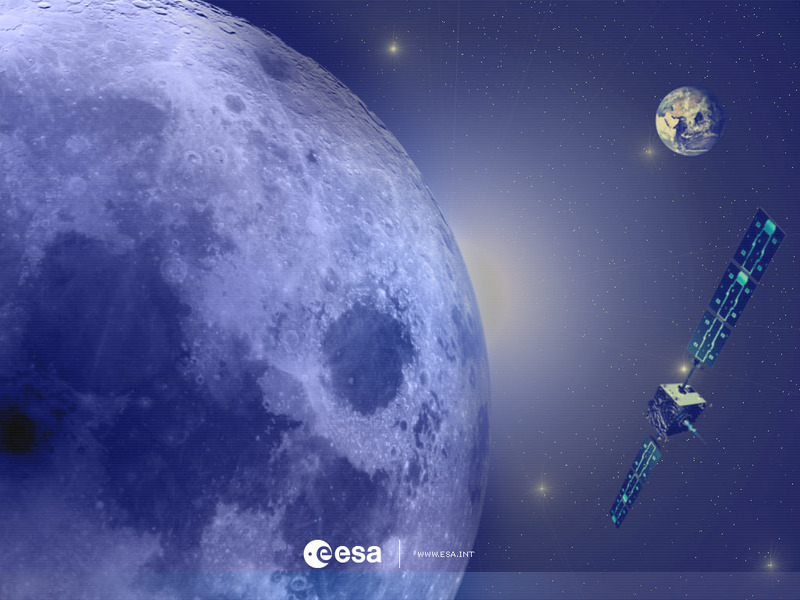 Europe reaches the Moon ESA PR 60-2004. ESA’s SMART-1 is successfully making its first orbit of the Moon, a significant milestone for the first of Europe's Small Missions for Advanced Research in Technology (SMART) spacecraft. SMART-1 views Middle East and Mediterranean Now more than 100 000 kilometres away from Earth, ESA's Moon-bound spacecraft SMART-1 looked back at Earth and returned this planetary perspective of the Middle East and Mediterranean Sea. SMART-1 views Europe The first picture of Earth taken by the SMART-1 spacecraft on 21 May 2004 from a distance of 70 000 kilometres. SMART-1 pauses to take in the view ESA’s SMART-1 spacecraft is now in its 207th orbit, in good health and with all functions performing nominally.